Figure 1.1. 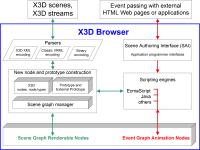 Example software architecture for an X3D browser. Figure 1.2. 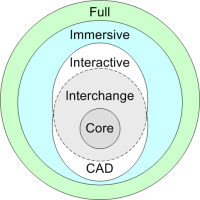 The family of X3D specifications includes multiple file encodings and programming-language bindings, all mapping to the same common functionality defined by the abstract specifications. Figure 1.3. Multiple X3D profiles providing increasing sophistication allow more efficient browser support for lightweight content. Figure 1.4. Example meta tags in newScene. x3d. Figure 1.5. 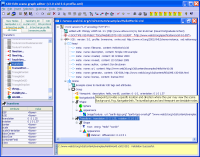 XML documents have a consistent tree structure for elements, attributes, and values. Figure 1.6. 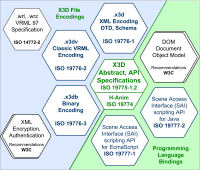 Processing chain to start with any X3D content, apply geometric compression (if desired), add XML security features (if desired), and produce .x3db compressed binary encoding. Figure 1.7. X3d-Edit is an XML-based Java application for creating and launching X3d scenes.